Update: General consensus among my bird-watching friends who have reviewed the pictures and assessed the plumage is that this owl is probably a “she” and not a “he” as was originally written. 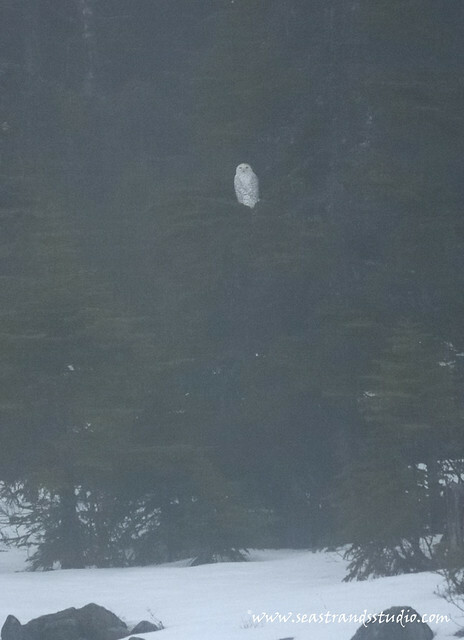 I concur and add that this owl was larger than I was expecting, having seen other male snow owls, which adds credence to the theory that this is a female and not an immature male. I have therefore modified the description accordingly. I’m a little giddy about the owl. Let me back up a step. 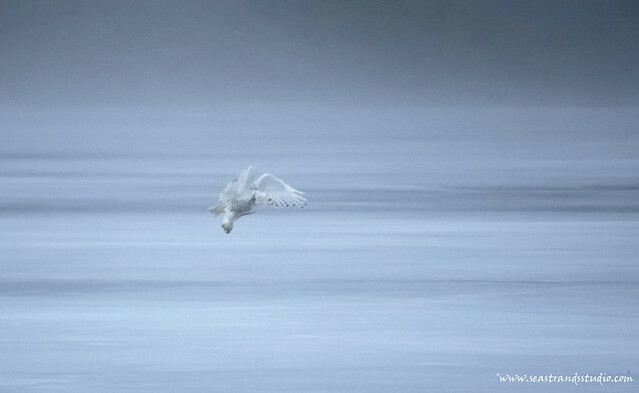 The day before yesterday, a friend mentioned that she had seen three snowy owls in Pippy Park (thanks, Margaret O’Dea!). 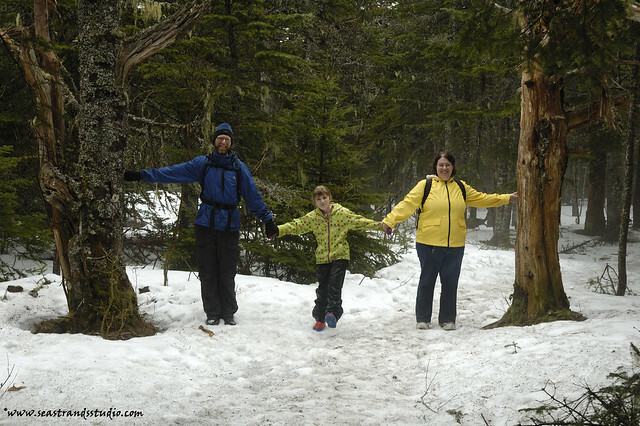 This morning, I decided that an owl hunting expotition was in order and so we (we= me, John, Katherine & my sister, Tamar) packed up and headed to Pippy Park. 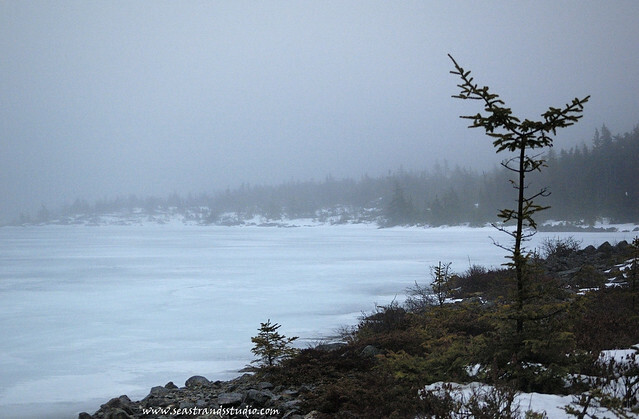 We found the trail, headed up towards Three Pond Barrens and used our GPSrs and the waypoints for a couple of geocaches (of which we found neither, but only actually looked for one) to keep us heading in more or less the right direction. 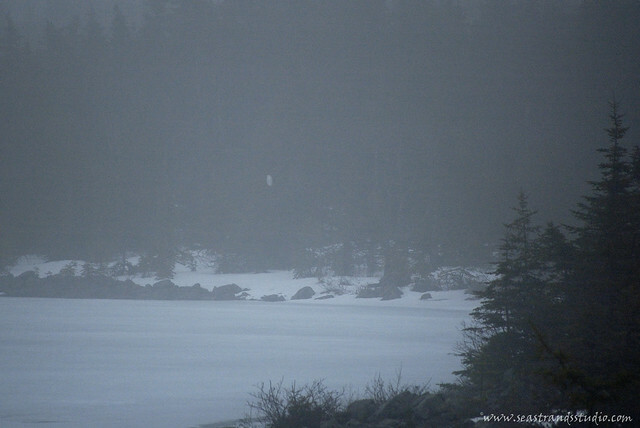 There is a snowy owl in this picture. She let us get a bit closer. This is with my 200mm zoom lens at full extension. 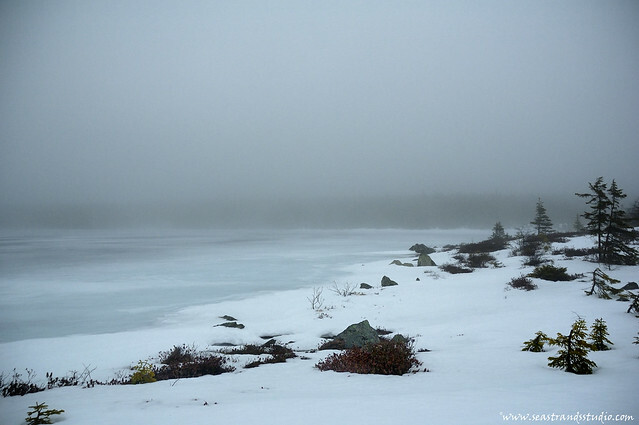 The mist made everything grainier. Then she landed out in the middle of the pond and stood there for the longest time, watching us. As we wandered around Big Pond, she kept swiveling her head to watch us, occasionally checking the other shores for movement as well. 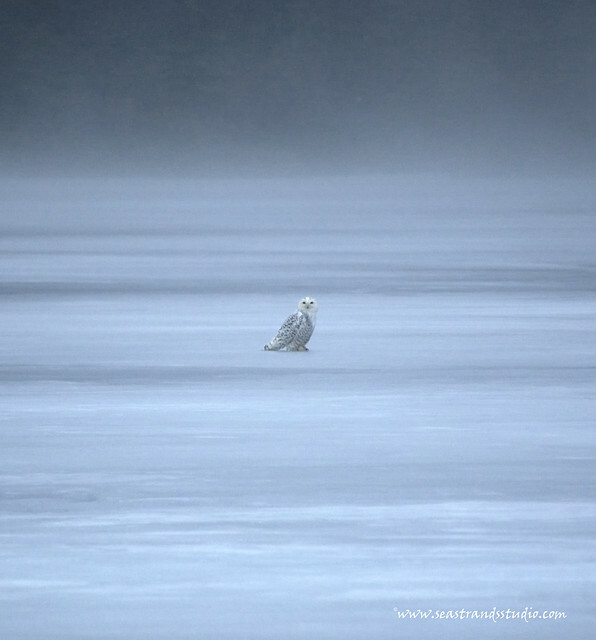 With the naked eye, I couldn’t see more than a white lump on the ice, but the zoom lens gave me more detail. 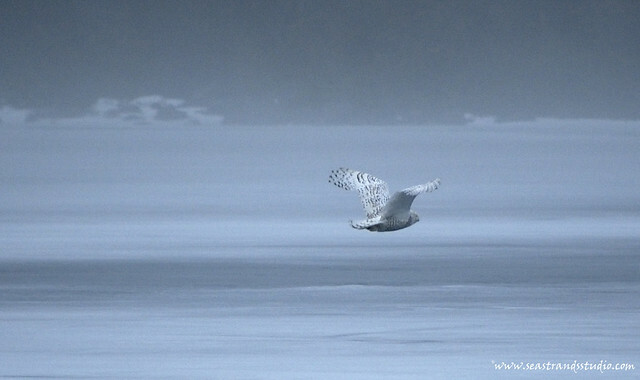 You would never know there was an owl out on that ice. 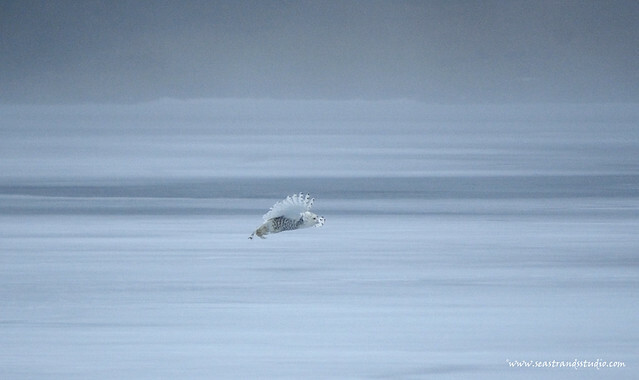 Then she took off again and soared around, landing on the far shore. 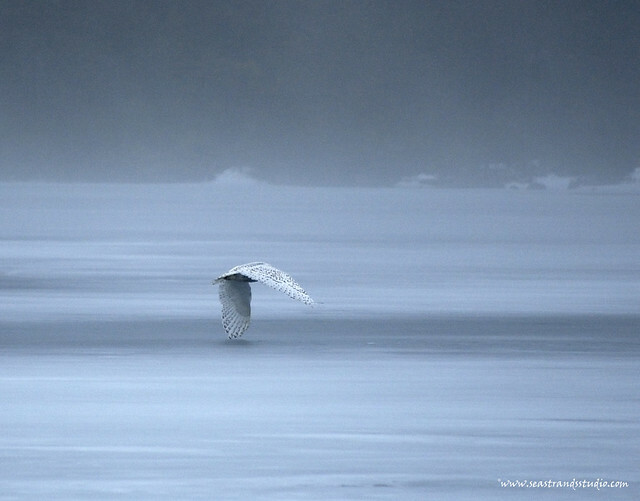 I particularly love this shot, where her wing tip just brushes the ice…..
We slogged around up to our hips in rotten snow (that’s snow that has warmed up and sometimes melted underneath, in case you don’t live where such terms are common). 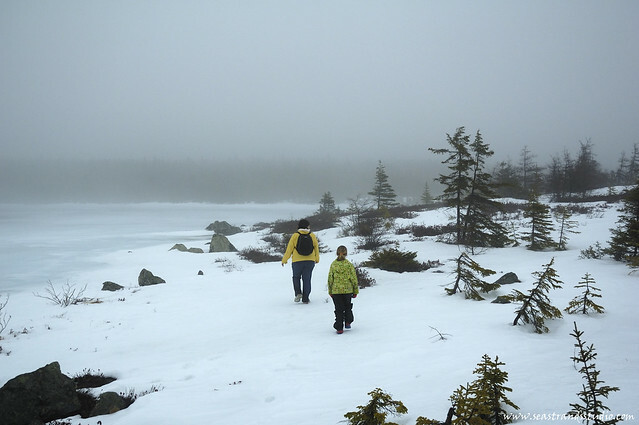 There were numerous spontaneous discoveries of the big rocks and water beneath the snow and we emerged rather sodden, but very happy. A perfect way to spend part of the long weekend! Thanks! 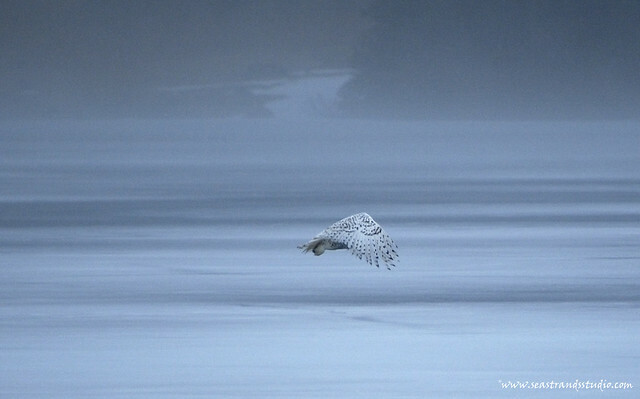 I suspect the fog helped and I also think that owl knew that we couldn’t follow her out onto the slushy ice. She probably felt pretty safe out there. 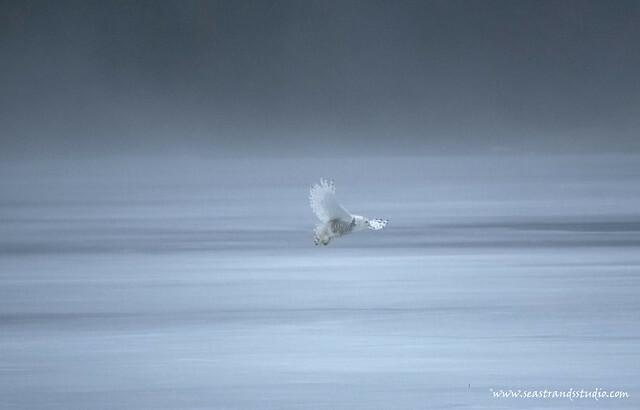 I’m not a particular fan of owls, but these pictures are quite amazing. I’ll never forget the time I was outside of Caines’ store waiting for the bus and a Snowy Owl spooked a pigeon out of its roost. The owl took the pigeon right out of the air over Duckworth Stret and flew towards the Battery with a path of falling pigeon feathers trailing behind it. Incredible! That must have just been awe-inspiring.